Sundance 2019 is returning to its roots in many ways and breaking boundaries in others. These are the films we screened and recommend you keep an eye out for! It almost feels like old news, the downfall of Harvey Weinstein. But the effects of his demise are still reverberating in Hollywood and worldwide. The movie mogul's rise and fall are meticulously examined in Ursula Macfarlane's documentary Untouchable. By now, we've heard from many of the high-profile actresses he sexually assaulted. But Macfarlane chooses to highlight the voices of those who worked with Harvey early on, staff at the young Miramax company and some of not as outrageous famous talent who crossed his path. Ursula even allows some of the men who worked with Harvey to speak out about the verbal and sometimes physical abuse and bullying they experienced. We also hear from the journalists who were working to expose his deeds and how after many threats and terrifying experiences the truth came out. Tuesday: These are the stories from the non A-list stars, from some we haven't heard about. Weinstein is portrayed as an egomaniac whose male staff wasn't even safe from his verbal and physical abuse. The documentary outlines exactly how a man like Weinstein gets away with these travesties for such a long time. While some of the stories are not new, hearing the firsthand accounts on screen in such a raw format reawakens the emotions all too familiar in the #metoo movement. For Veera Lapinkoski, sword fighting and shooting monsters is very much part of her reality. An avid LARPer, Veera, or V as she's called when in character, uses the fantastical battles as therapy to face her real life demons and cope with her troubled childhood. Scarred by her alcoholic and abusive father, Veera strives to become her own hero. Director Tonislav Hristov told us that he stumbled upon Veera's story after learning she was into LARPing. Curious to know more he discovered that she used Live Action Role Play to cope with her past. Kaely: Cinematically compelling, The Magic Life of V is beautifully shot. Every moment is perfectly captured to where you question whether or not you're watching a documentary. However, the film did not adequately explain where Veera's trauma came from. We're presented with the barest understanding of what happened to Veera and her brother. Their father was an alcoholic, but it's unclear if he was only verbally abusive or if he was also physical or sexually abusive. The pace meandered, weaving from her day-to-day where she's with her brother or doing LARPing practice, to scenes with her therapist and long shots of Veera just walking, the story drags with the final payoff feeling bland. If Hristov used a more journalistic eye for profiling this film could have been a lot stronger. Tuesday: How some cope with trauma by drinking alcohol or acting out, Veera uses LARPing. Sadly, they never really tell you what her trauma is or was and, in turn, discredits her emotions. According to the Q & A after the film, the director met Veera by happenstance and just started filming her. Sadly, that's exactly how the documentary flows. The pace is lackadaisical and boring. Besides her family and LARPing, we actually learn very little about Veera, like whether she's a student or has a job. Although the film was beautiful on scenery, I left with nothing more than a new understanding of live action role playing. In this quirky animated short, a brother gets a new sister and discovers that having a sibling isn’t a walk in the park. His infant sister eats up all the attention and devotion of his parents, literally. They fight constantly, but then they have sweet moments of coming together. But then it is revealed that his sister was actually never born. In fact she was aborted due to China’s One Child policy. The director dedicates the film to all the unborn siblings. From 198**-2015. Kaely: The stop-motion animation caught is instantly compelling. And unlike the sometimes eerie claymation of Tim Burton’s films, these characters are made of felt and are soft and plushy. It lends a certain warmth and approachability to the characters, even though the felt doesn’t allow for as detailed expressions. The story really strikes a cord, managing to accurately illustration the love-hate relationship of siblings, particularly brother-sister relationships. But the dramatic turn was wholly unexpected and made the film unforgettable. Tuesday: China's One Child Policy continues to effect generations beyond its inception. Song doesn't shy away from her opinion on the subject and packs extreme emotions in a small amount of time. Try not to cry. Gook director Justin Chong returns this year to Sundance with a stunning Korean-American story about two siblings reuniting as their father's health fails. Ms. Purple is moody, complex, and has no easy answers. Kaely: The story touches at the heart of family relationships to which anyone can relate to. At the same time it's very much a Korean-American film where ties of family duty and the dark underbelly of Korean society rub shoulders with the American dream. The performances are brilliant and the writing and directing on point. Definitely one of my top picks for the whole festival. ​Tuesday: I laughed, I cried! I absolutely loved this film. The underlying metaphors brilliantly shine through and show that our families aren't as different as we think they are. It touches on issues many of us have - things left unsaid, estranged relationship, divorce, the slow loss of a loved one, doing whatever needs to be done to pay the bills. The film shines a light on LA's Koreatown and shows how old world and new world come together. A must-see film. Foggy forests and an isolated farmhouse make for a stunning backdrop to this one of a kind ghost story. Marin Ireland and Jim Gaffigan star in writer-director Paul Harrill's drama about four characters wrestling with personal choices while investigating a possible afterlife presence. Ireland plays a single mother, Shelia, who is a part-time paranormal investigator. She gets a call about a man who's house is supposedly being haunted by his recently deceased wife. 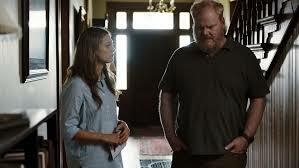 The husband, Richard (Gaffigan), is unsure if it's just grief and lack of sleep causing him to see things, or if his wife is really trying to contact him. Shelia is a skeptical ghost-hunter herself and has yet to have a real encounter with a spirit that she can believe. Together she and Richard connect on what it means to grieve, move on, and what the afterlife could be. Kaely: Soft, quiet, and unlike any ghost movie before it, Light From Light moves at its own pace. It foregoes the scary tones of many ghost stories and chooses instead to focus on the human relationships that bind us. The film does meander, though, and there is a whole story line with Shelia's son that seems extraneous. The film is visually stunning, the performances very gentle and moving, but there is a sense of something missing. More of a drama than a thriller, Light From Light looks more at relationships than ghosts. Gaffingan proves he can do more than just funny. The movie is quiet but doesn't lack for emotion or strong storyline. Shia LaBeouf explores his childhood in the very meta film Honey Boy. Pulling from his own life experiences of growing up as a childhood actor, Honey Boy reveals that being a young star is not as glamorous as one might imagine. This is hammered home by the repetitive demeaning, and physically and psychologically demanding work that actors go through. Otis plays the young star while Shia LaBeouf plays his father, who is an ex-rodeo clown and felon. We see the dysfunctional life both live as Otis seeks his father's love and support but is denied any real connection. In this way, LaBeouf seems able to work through his father issues which have haunted his life. By stepping into his father's shoes he could perhaps grasp what was happening with his own father when he was a child. ​Amazon bought the film, so you can expect to see it soon. Kaely: This film was a big surprise. It is not inaccurate to say it was a brilliant piece of film making. Everything from the story line to the cinematography captured you. LaBeouf, for all his sins and foibles is an incredible actor. And this is something Honey Boy reminds us of. Honey Boy reminds us that PTSD can happen to anyone in any situation. Tuesday: My favorite from Sundance 2019. The non-linear story jumps back and forth answering our questions as it moves. If you had to describe the modern use of the term 'meta', all you'd need to do is show this movie. LaBeouf and Har'el take turns adding their expertise to make an outstanding show. I won't call it a comeback but I hope to see more of Shia in the future. Directors Christina Ibarra and Alex Rivera took an unexpected step in their film, The Infiltrators. Blending documentary film making with narrative, they tell the story of the efforts by the National Immigrant Youth Alliance (NIYM). The organization is an eclectic group of DREAMERs who took on U.S. Immigration and Customs Enforcement (ICE). The group hatched a plan to infiltrate Florida's Broward Detention Center and work from the inside to get non-violent, low-risk migrants out of prison. The film primarily follows the story of Claudio Rojas, an undocumented man who was detained outside his home after living the US for decades. DREAMER Marco Saavedra was the man on the inside. He got detained and was sent to Broward as well. After locating Rojas, he began working with him to identify other candidates who could be released. Saavedra was backed up on the outside by NIYM who worked with lawyers to get people out and back to their families. Since the filming inside the detention center was impossible, the directors chose to dramatize what happened on the inside based on Saavedra's experience. Kaely: The film is a solid rebuke against ICE's often times questionable practices. Blending actual footage with dramatization was both unexpected and innovative. Being able to see the actual footage was really compelling and brought to light the danger these DREAMERs were taking on. However, some of the actors were a bit stiff which made the dramatization feel amateurish. Over all, a very different type of documentary. Tuesday: Similar to the young Stoneman Douglas gun law activists, DREAMER's will make progress on immigration reform. We get an inside look on what's really going on at detention centers along the border. Surprise, it isn't how we think it is. While I enjoyed the mix the actual footage and interviews with dramatizations, the acting was subpar.